Hi. My name is Gary, and I have an addiction. All kidding aside, it's a privilege and honor to be chosen as Tank of the Month at Reef Central. 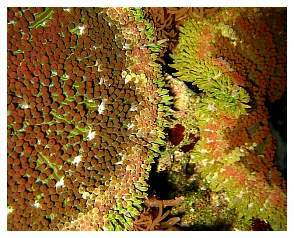 I've always been interested in the biodiversity of life on planet Earth. 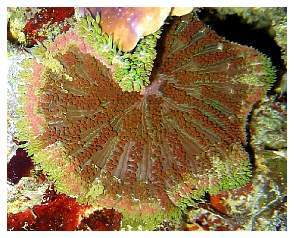 When I first discovered that reef aquaria existed, it didn't take me long to scramble to find out as much about them as I possibly could. 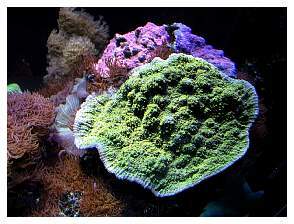 After a year or two of reading whatever I could get my hands on, I started my first reef aquarium in 1993. 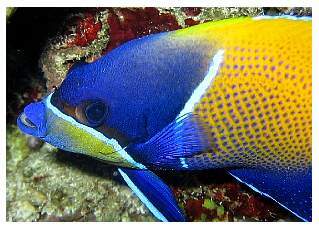 This research paid dividends: my very first reef aquarium was a success. I soon started phytoplankton and rotifer cultures to feed the larval clownfish I was raising. 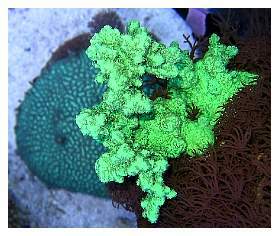 I set up several small coldwater reef systems and a second reef aquarium. 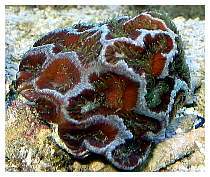 I also started "fragging" small-polyped stony corals and trading them in for credit at the local fish stores in my area. 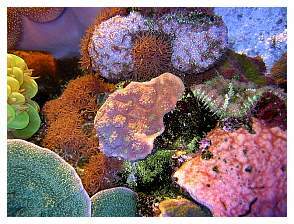 When we moved into our present home, back in '97, I set up one (larger) reef system to house everything I had accumulated up to that point. 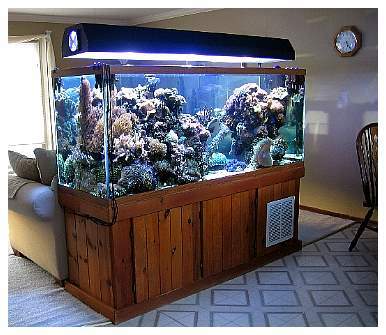 My present display aquarium is a 72" x 24" x 30" 225-gallon "high" tank manufactured by Perfecto. Perfecto drilled it for two returns and one drain where I specified the holes to be located - down the middle of the aquarium's bottom, so the returns and drain are internal (inside the display). 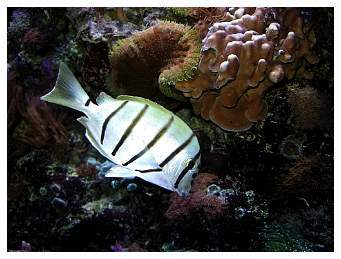 I did this because the aquarium is set up as an "island" display, meaning it can be viewed from all four sides. 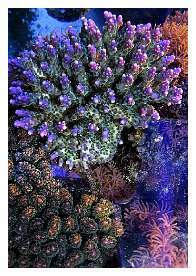 We actually tore down a wall in the house and replaced it with a reef aquarium. The main drain and water returns are plumbed down through the bottom of the aquarium and its stand to our basement. The internal standpipes were surrounded with cinder blocks to protect them from shifting rock. 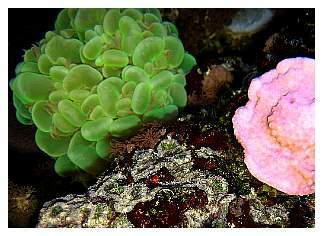 I then used "Thorite" marine cement to bond the live rock together over the cinderblocks to hide the standpipes. The only regret I had with my original design was not having two drains, so I added a second drain in 2004. I have a 75-gallon aquarium that's been drilled for sump duty. 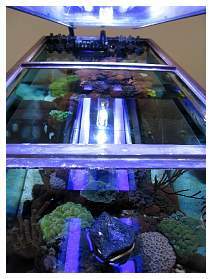 The main circulation pump is an Iwaki 100RLT with two return lines to the display aquarium. Additional circulation in the main display is achieved with powerheads connected to a wavemaking device. 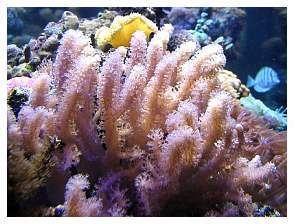 Mechanical filtration is provided by running the drain line through a 100 micron filter pad located in the sump. 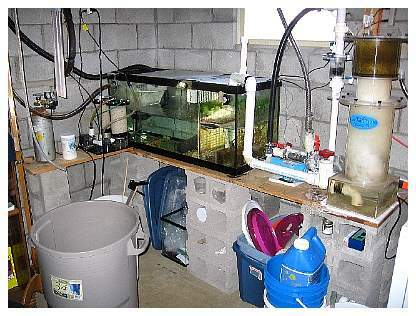 A 30" Beckett skimmer powered by a GenX PCX 40 pump provides additional filtration, and a My Reef Creations calcium reactor helps to keep calcium the optimum level. The sump also houses both the heaters and the thermometer. Carbon is run continuously in the sump. 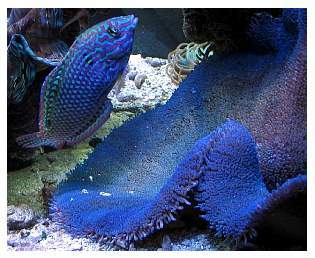 Cleaning four sides of an aquarium is much more of a chore than cleaning just one side, and I typically do this whenever I can - at least once every other day. I use quick sweeping motions with the cleaning magnet to help stir up any detritus that might have settled near the corners of the glass. 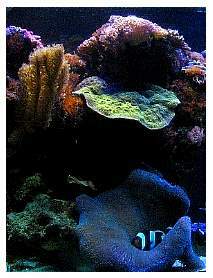 This also helps prevent coralline from getting a foothold on the glass. 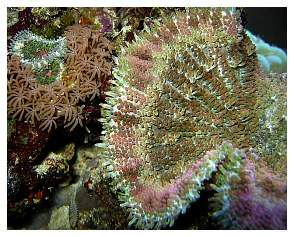 Water changes (roughly 21%) are performed weekly. Water parameters are checked monthly. Makeup water for evaporation top-off is kalkwasser (limewater). 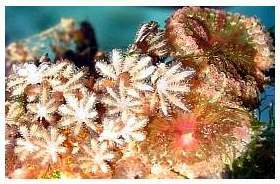 The system and its inhabitants are inspected daily. I've always thought that feeding is an important and often overlooked subject. 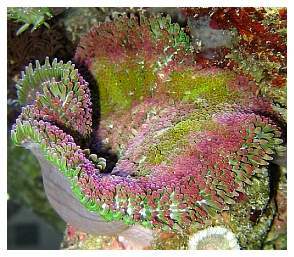 I've always heard, "You are what you eat," and I believe this is also true for our reef animals. I feed a variety of good foods daily. 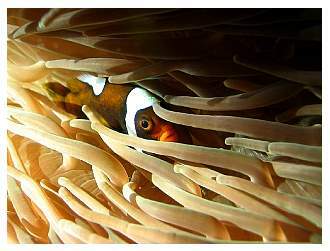 Some of the "meaty" foods listed here are specifically for anemones: nori, VibraGro (Saltwater Staple) pellets, frozen HUFA enriched mysid shrimp, frozen HUFA enriched Artemia, scallops, silversides, smelt, Cyclop-eeze, frozen broccoli florets, frozen orange sections, ProGreen (by Pro Salt) and Ocean Nutrition flakes. A small "snowstorm" of food is fed daily. 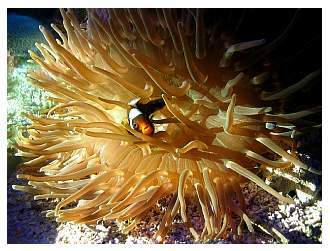 Anemones and certain large-polyped stony corals are target fed larger foods at least once a week. I'm currently using a 72" PFO powder-coated aluminum light fixture suspended from the ceiling by a height-adjustable cable kit. It's very nice to be able to easily raise and lower the light hood. The lighthood contains one single-ended 400-watt Hamilton 14K metal halide bulb located in the center of the tank, and it's flanked on either side by two 250-watt 6500K Iwasaki halides. All metal halides are powered by Blueline electronic ballasts. Supplemental lighting consists of two 72" VHO actinic fluorescent lamps. 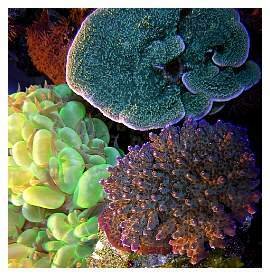 Additionally, the tank also receives some direct and indirect natural sunlight. 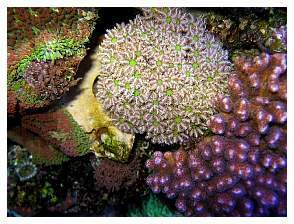 It might not be apparent at first glance, but my aquarium is an anemone-dominated reef. 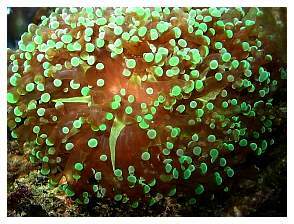 As I alluded to earlier, the very first livestock addition in my first reef aquarium turned out to be a type of miniature carpet anemone that was attached to a piece of live rock from Indonesia. 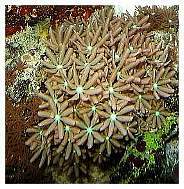 This anemone, Stichodactyla tapetum, is well known to many reefkeepers who frequent Reef Central, but it's relatively unknown in the reefkeeping community at large. 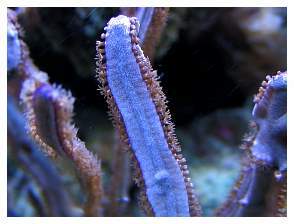 I've recently introduced a larger morph (>5" diameter) of S. tapetum to my aquarium. 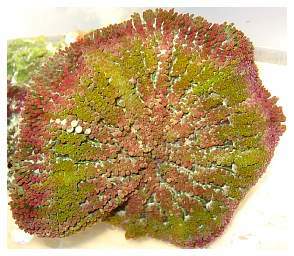 Each "mini" and "maxi" carpet anemone is somewhat unique in its color pattern. 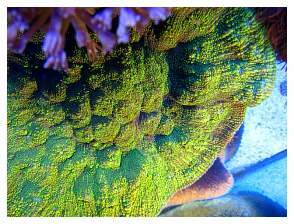 Several of these anemones are incredibly colorful (almost as if they were "tie-dyed"), and I've never seen anything like them anywhere else. 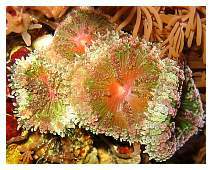 In addition to the "mini carpets" I have several other types of anemones: an unidentified small anemone species that is commonly called a "Tulip" anemone, a blue Haddon's carpet anemone, S. haddoni, and a Long-tentacle anemone (LTA), Macrodactyla doreensis. 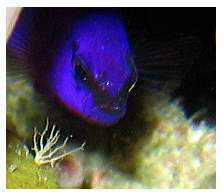 Both the LTA and the blue Haddon's anemone have spawned in my aquarium. 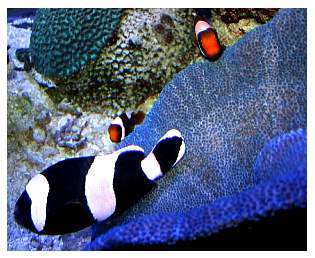 Two Saddleback anemonefish (A. polymnus) share the two larger anemones. 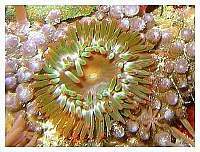 In addition to anemones, I have many other invertebrates. 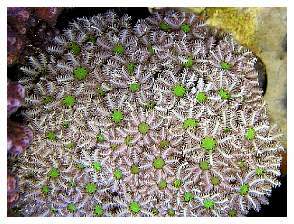 Several are "reef janitor" types that hitchhiked into my aquarium and work to keep it clean - Stomatella spp. 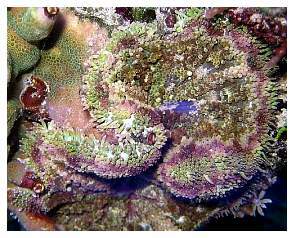 snails, Ophiactis (small brittlestars), unidentified sponges and many types of segmented worms, as well as numerous chitons and limpets. 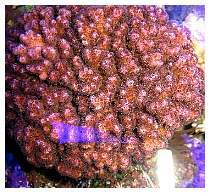 Purple mushrooms were my first invertebrate livestock purchase, in '93, and they are still alive today. 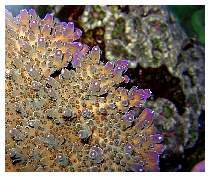 I have a table Acropora that I introduced in '94 and another type of Acropora that I introduced in '93. 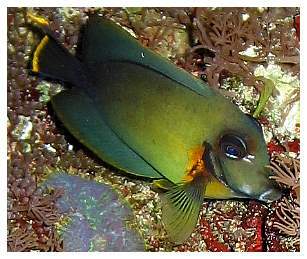 Many other additions were made over the years, with most of them being captive propagated or accidentally arriving as hitchhikers, but a few were "wild caught." 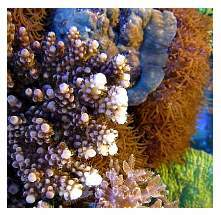 Acropora, Montipora, Pocillopora, Seriatopora, Porites, Sarcophyton, Clavularia, Rhodactis, Echinopora, Echinophyllia, Oxypora, Favia, Leptoseris, Tubipora, Sinularia, Acanthastrea, Zoanthus, Protopalythoa, Pseudocorynactis, Pavona, Euphyllia, Plerogyra, Turbinaria, Caulastrea, Platygyra, Hydnophora, Heliopora, Xenia, Sansibia, Plexaura, Plexaurella, Pseudoplexaura, Pterogorgia, Millepora and several yet-to-be-identified corals. 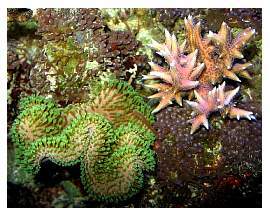 Other invertebrates also include one Tridacna maxima and one T. crocea, along with a sea cucumber, Holothuria impatiens. 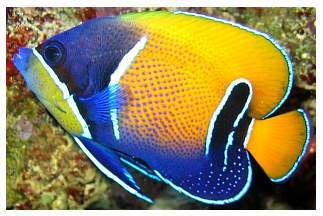 Before I say goodbye I'd like to thank my wife, kids, friends, family, members of Reef Central and our local reef aquarium club (the "Upstate Reef Society" of upstate NY) for all of your support, advice, constructive criticism and patience over the years.